As we all know, there is going to be a time where we either die or Jesus will come back. Either way, we will be judged. The way we live our lives today can actually determine someone else’s salvation. There are people that we are friends with who do not go to church, they may say that they are Christians but don’t attend church, they may not read the bible… So in a sense, the way you live is the only “church” they will see. You are the ‘Christianity’ in their life (if that makes sense). If you were to die today, what legacy would you have left behind? What will you be remembered by/for? Deep questions… Or if someone close to you dies for example (God forbid), do you think in their journey of life you helped them? Would you feel like you did everything you possibly could to make sure they were right with God? As Christians, when we see people doing wrong we are scared to correct them because we know in ourselves that we aren’t perfect… So there’s a fear that it will get thrown back in our faces. We aren’t perfect, we do need to be helping each other out. We need to be investing into other people’s salvation. We need to be giving time to people that need help. There are many people in our lives that are struggling right now, going through one thing or the other and all we are saying is “I’ll pray for you” or “you are healed in Jesus name!”. You know, sometimes YOU are the solution to the problems a person might face.. It might be that God has put the solution in you to deliver to the person but you’re saying God will sort it out. A lot of us are privileged to have been going to church or to have been exposed to Jesus from when we were young, some of us don’t have that privilege. There are people that are struggling in one way or the other and the solution is so simple, but because they don’t know about Jesus. How can they know if we do not tell them? 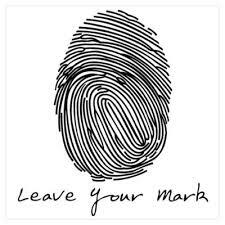 Again, where will you leave your mark? This is something that I’m asking myself. I don’t want you guys to think that I have it all figured out.. I really don’t. It does seem like a big responsibility but when you take care of God’s business, when you are doing what He says, He will take care of your business. Everyone leaves a mark. For good, bad or indifferent, we all leave footprints behind us. We will be remembered for our generosity or selfishness. There’s only one way to leave a Christ-like-mark. You cannot do it by yourself. You cannot find life in loving God and loving the people around you, because it is a commandment. Scriptures make it so clear that the letter kills, but the gospel brings life (2nd Corinthians 3:6). Ask for Christ’s mercy, allow Him to fill you with His Spirit, and watch as He empowers and teaches you how to love Him and others.